Iranian foreign ministry spokesman has strongly denounced the US president’s move to sign a bill on new anti-Iran sanctions, saying the country reserves the right to respond to Washington’s measures against the Islamic Republic. 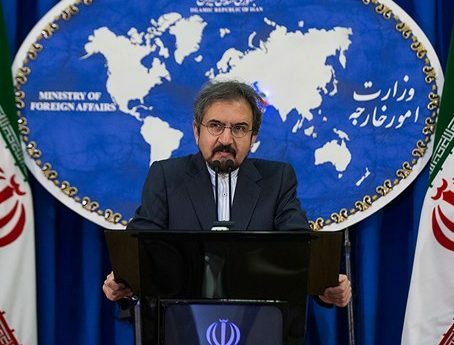 In a statement on Thursday, Foreign Ministry Spokesman Bahram Qassemi condemned Trump’s signature of the new anti-Iran sanctions earlier passed by the US Congress. Qassemi dismissed the move as regressive, illegitimate, illogical and contrary to all human principles as well as international laws. He denounced the move as one of Washington’s latest ant-Iran actions and another instance of US animosity toward the civilized and cultured people of Iran as well as an insult to all freedom-seeking people across the world. The spokesman underlined the reality that the recent legislation affects successful implementation of a nuclear deal between Tehran and six world powers known as the Joint Comprehensive Plan of Action (JCPOA), and added the law is slammed by different countries, including US partners. “The move by chaos-seeking bullies and extremist, malevolent elements ruling the United States once again displayed the US’ unilateralism and illogical hostility,” said Qassemi. He then touched upon a recent meeting of the committee tasked with monitoring the implementation of the JCPOA as well as the decisions adopted to counter the new US legislation. “Iran has stood up to the United States’ hostile moves, and, as always, is pressing ahead with its efforts to ensure stability and security, and relentlessly continues its fight against terrorism in a bid to promote peace and stability in the region,” he noted. “Iran will, by no means, allow the expansionist and destabilizing policies of others to bear fruit,” said Qassemi. He reiterated that Iran reserves the right to respond to the US government’s anti-Iran moves, and will patiently, tactfully, and prudently take action in due time in line with the interests of its people and national interests. “Undoubtedly, the Islamic Republic of Iran will not fall into the traps of the evil triangle of hegemony, Zionism, and Wahhabi terrorism,” he noted. He urged US statesmen to work toward settling the numerous crises which exist in their country rather than playing a blame game and taking anti-Iran actions. He also urged them to avoid kicking up a fuss, which has already been tested and proven futile, and not to jeopardize global peace and security any more.